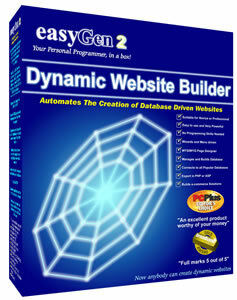 This website is a dynamic web site that was created using easyGen. All the content of our web pages are held in a database, these web pages pull the relevant data from the database and display them, as you can see. However, easyGen can do so much more than a simple data driven web site, it can create reports and calculations from the stored data, it can password protect pages, create feature rich shopping systems and fully blown data management systems. Just about anything you can imagine. What's even more amazing about easyGen is there is no need to know any programming language or knowledge about databases easyGen because does it all for you. And then outputs the project in PHP or ASP (Active Server Pages) script pages and will connect to any popular database including Access, MySQL and SQLserver databases. See for yourself how easy and powerful easygen is visit the easyGen site and find out more or download your free trial and see what you could create in minutes with easyGen.